BENEDICT of CAMPANIA, a hermit in the Campania (the area of present-day Italy in and around Naples) and friend of St. Benedict of Nursia (11th July), St. Gregory the Dialogist (3rd September) also mentions him in some of his writings. St. Benedict was taken prisoner and thrown into a fire by the army of Totila, King of the Ostrogoths (r. 541–552). He remained in the fire for an entire day before emerging completely unharmed. St. Benedict lived until circa 550, reposing of natural causes. ETHILWALD, a monk at Ripon, St. Ethilwald lived as an anchorite on the Island of Farne for the last twelve years of his life, reposing in 699. 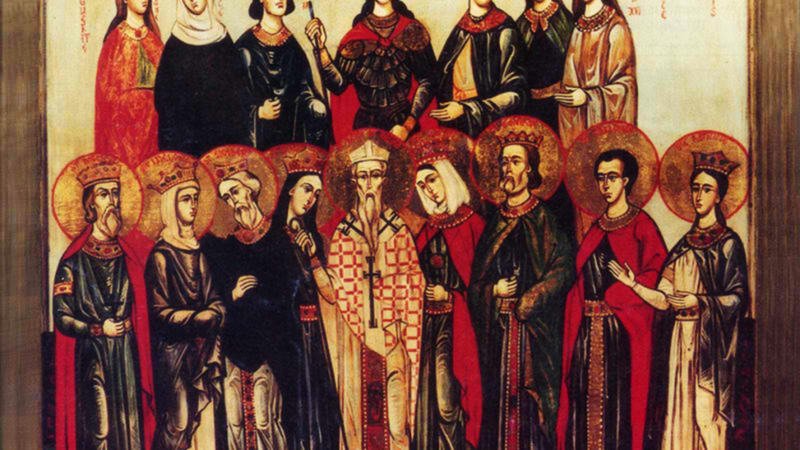 FELIX and COMPANIONS, aside from brief mentions in the old martyrologies, and by St. Bede the Venerable (25th May) there is nothing known about these saints. Out of a group of twenty-one, only the name of St. Felix is known. Beyond that, it is known they were martyred in North Africa in the late-fifth century during the reign of the Arian Huneric, King of the Vandals (r. 477–484). FELIX of MONTE CASSINO, a monk at one of the dependencies of the Abbey of Monte Cassino who reposed circa 1000. Following St. Felix’s repose many miracles were reported to have taken place at his tomb, leading the Bishop of Chieti to have St. Felix’s relics enshrined and made available for veneration. FIDELIS, (Date Unknown), a martyr in North Africa of whom nothing is known. Some hagiographers reckon him to be part of the group martyred with Felix (vide supra) under the Arian Huneric, King of the Vandals (r. 477–484), though he is most likely not connected with them. FRUMENTIUS, a wealthy merchant in Hadrumetum (present-day Sousse, Tunisia) who was martyred for refusing to convert to Arianism during the persecutions under the Arian Huneric, King of the Vandals (r. 477–484) in 484. MAIDOC (MO-MHAEDOG), (Fifth Century), an Abbot of Fiddown in southern Co. Kilkenny in Ireland, nothing further is known about him. NICON and COMPANIONS, a Roman soldier and leader of a group of monks who took up monastic life whilst in the Holy Land. Hoping to escape the persecution going on at the time in the Holy Land, St. Nicon and his brothers fled to Sicily. Sadly, there they found not safety, but the Decian Persecution, and all were martyred circa 250. VICTORIAN, CRESCENTIUS, LIBERATUS, and COMPANIONS, St. Victorian, a pro-consul of Carthage, St. Crescentius, a priest, and St. Liberatus, a wealthy merchant. All of whom, including St. Liberatus’ wife and children, were martyred in 484 at Hadrumetum under the Arian Huneric, King of the Vandals (r. 477–484) for refusing to abandon orthodox Christianity and embrace Arianism.